Turin factory will build Jeep models for U.S.
Fiat S.p.A. CEO Sergio Marchionne won narrow backing from workers for a labor deal that clears the way for Jeep models for the U.S. market to be built alongside Alfa Romeos in Italy. Workers at Fiat's Mirafiori factory in Turin voted 54 percent in favor of the groundbreaking contract that limits strikes and absenteeism in exchange for investment. Marchionne, who engineered the Italian carmaker's 25 percent stake in Chrysler Group, which includes the Jeep brand, and transformed Fiat from an ailing conglomerate, had threatened to move production abroad if workers rejected the changes. Fiat's top executives said they were pleased with the outcome of the vote and hoped the deal would begin a new era in labor relations free of acrimony. "Now we need to put controversies and contrasting positions behind us and face the challenges that we have before us in a constructive manner," Fiat Chairman John Elkann said in a statement on Saturday. Fiat and Chrysler plan to invest more than 1 billion euros ($1.32 billion) in the Mirafiori factory to build Alfa Romeo cars and SUVs and Jeep models for European and North American sales as part of a new joint-venture company that will take control of the plant. The factory will build the mid-sized Giulia sedan and station wagon, which will replace Alfa's 159 range, as well as medium SUVs for the Alfa and Jeep brands. Output is scheduled to start in the third or fourth quarter of 2012. Half of the production will be sold in Europe and the other half will be exported, mainly to North America. The Alfa models are a crucial part of the brand's relaunch in North America. Fiat will cover about 60 percent of the cost, about 600 million euros, because it wants about 150,000 Alfa models a year. Chrysler will pay roughly 400 million euros to get an annual supply of about 100,000 units of the next-generation Jeep Compass/Patriot that is due to launch in 2013. After the vote, Bruno Vitali, head of the FIM union said: "Now the industrial plan for Mirafiori will go ahead. Marchionne has to quickly deploy the investment, as he promised." More than 96 percent of workers took part in the referendum on Thursday and Friday. The contract has already been agreed at Pomigliano, another of Fiat's Italian car factories. The contract is part of a Fiat-led unprecedented overhaul of Italian labor relations, which have been based on national deals rather than on a plant-by-plant basis. The deal is part of a 20 billion euro "Fabbrica Italia" plan to double Fiat's domestic auto production by 2014. It targets widespread absenteeism by curbing pay for those who take repeated sick leave around holidays and by ending wildcat strikes. It cuts the number of breaks per eight-hour shift to three from four and raises the number of shifts to 18 a week from 15. Fiat can also call on each worker for 120 hours of overtime per year without union approval. 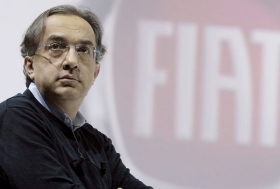 Marchionne's threat to shift production abroad made Mirafiori the most important issue in the country in the past two weeks, with daily front-page coverage by major newspapers, and commentary from political leaders including Prime Minister Silvio Berlusconi. The vote is “symbolic” and “represents a turning point for the country as Marchionne is trying to break an industrial scheme which needs to be reformed,” Gianluca Spina, dean of the business school at Milan's Polytechnic, said before the referendum result was announced. Opened in 1939, Mirafiori currently employs about 5,400 workers. The factory produces the Fiat Idea, Multipla, and Punto Classic, the Lancia Musa and the Alfa MiTo. Next month Fiat will end production of the 1998-launched Multipla medium minivan and Punto Classic subcompact, which debuted in 1999. Production of the Idea and Musa small minivans will continue until 2012, which is when production of their replacements is set to start in Serbia. Mirafiori workers built 178,000 cars in 2009, compared with the 600,000 assembled by 6,100 workers at Fiat's factory in Tychy, Poland. That means, without taking into account the differences in models and the working hours, productivity at Mirafiori averaged 30 cars per employee a year, compared with almost 100 at Tychy. Fiat's European carmaking operations could generate a profit of 390 million euros in 2011 if Fiat were to shift all production to Serbia and Poland, according to Kristina Church, a London-based analyst at Barclays Capital, who predicts a loss for that business of 855 million euros for this year after a 684 million-euro loss in 2010. Fiat's European sales fell 17 percent last year and its market share dropped to 7.6 percent from 8.7 percent in 2009.